ROBINAU DE NEUVILLETTE, DANIEL, officer serving with the troops in Acadia; b. 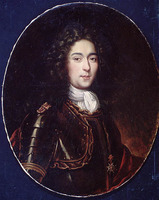 1672 or 1673, son of René Robinau* de Bécancour and Marie-Anne Leneuf de La Poterie, godson of Governor Rémy* de Courcelle, brother of Joseph Robinau* de Villebon, governor of Acadia; d. 1702. Neuvillette began his service in 1690 and the following year received a commission as ensign. 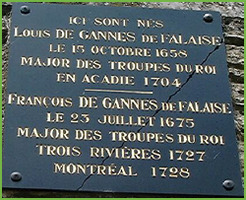 During the winter of 1692 he was in command on the Saint John River. On several occasions he carried out liaison missions between Acadia and Quebec, and he maintained good relations with the Indians. 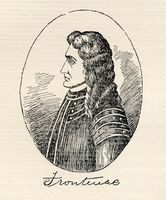 He lent active support to his brother in various situations, particularly during the attack by the English under Hathorne on Fort Nashwaak (Naxouat) in 1696. Buade* de Frontenac requested a lieutenant’s commission for him, and this was granted him on 3 April 1696. He then commanded small ships fitted out for fighting privateers and for protecting fishing, and in October 1698 he seized an English ship off Port-Royal (Annapolis Royal, N.S.). The ship however put out to sea while Neuvillette was carousing on land. His violent nature and his dissolute conduct with Indian women brought on him the hostility of Father Simon [La Place*], the commissary de Goutin, and certain officers. On 9 Dec. 1698 Louis de Gannes de Falaise wrote that Neuvillette was “a hot-headed man whose only occupation is engaging in debauchery, and who associates with the soldiers in order to use them for making contacts.” In 1699 he had to go to France at the king’s order to give an account of his conduct. His brother, the governor, sought the minister’s indulgence for “youthful indiscretions,” and this intervention was doubtless efficacious, for Neuvillette was able to return to Acadia at the beginning of the following year. He won the appreciation of the next governor, Brouillan [Monbeton], who described him as “very devoted to the service and very suitable for this country because of his knowledge of it.” Brouillan proposed him for promotion to the next rank, but his death prevented this. He was killed in 1702 in a combat against a brigantine from Boston which had just captured several fishing boats. AN, Col., B, 20, f.155v; 22, f.41v; C11A, 14, ff.13, 175; 20, f.158; C11D, 3, ff.70v, 105, 125v, 132, 156, 208; 4, ff.61, 225v; D2C, 49, 222. Coll. de manuscrits relatifs à la N.-F., II. NYCD (O’Callaghan and Fernow), IX. Webster, Acadia. Le Jeune, Dictionnaire, II, 454. Tanguay, Dictionnaire, I, 523; VII, 9. Étienne Taillemite, “ROBINAU DE NEUVILLETTE, DANIEL,” in Dictionary of Canadian Biography, vol. 2, University of Toronto/Université Laval, 2003–, accessed April 19, 2019, http://www.biographi.ca/en/bio/robinau_de_neuvillette_daniel_2E.html.